Indiana Wesleyan University awarded Marion High School teacher Bobbie Owensby with the 2018 Tony Maidenberg Award for community service during the annual employee convocation on Wednesday, Aug. 22. 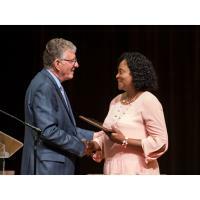 IWU President David Wright presented the award commending Owensby for her years of service as an MHS teacher, church leader and board member of The Clarence Faulkner Center. One of twelve children born to an Arkansas sharecropper, Owensby eventually moved to Marion in the 1970’s. She received her first teaching job at Marion High School in 1973 and has been there ever since, serving as a history teacher, a coordinator of African American studies and a role model for many young men and women. Annually, Owensby gives leadership to the Black History Club. The club, attended by approximately 30-35 students each year, works to present an annual community theatre production that inspires students to learn and express their talents. Proceeds from the theater production help to underwrite the cost of the much-anticipated annual Spring Break trip to historically black colleges and universities. Graduates of the Black History Club are currently serving as politicians, lawyers, doctors, forensic scientists and community leaders both in Indiana and across the country. In addition, Owensby has been active as a tutor and a summer enrichment program coordinator at St. Paul Baptist Church and The Clarence Faulkner Center. She serves on the board of The Clarence Faulkner Center providing leadership, as well as care, to the groups using the facility. In 2002, IWU introduced its annual award for community service as a way to recognize specific individuals for exceptional commitment and selflessness among their neighbors. Maidenberg, a former mayor of Marion and a former Indiana state senator, was its first recipient. The award was later named in his honor, and has been presented to 17 recipients to date.